There's something inherently comforting about a cup of ginger water or tea. And like other plant-based foods, research suggests this root can impart some serious health benefits thanks to its anti-inflammatory properties. To make ginger tea, simply add grated or sliced raw ginger to boiling water and let it steep for at least 10 minutes before straining. You can adjust the ratio depending on how strong you want the flavor to be. Jaclyn London, MS, RD, CDN, Nutrition Director at the Good Housekeeping Institute, cautions that ginger-flavored water is not exactly the cure-all or "detox" drink some people on the internet hype it to be. But, she adds, sipping the stuff regularly certainly can't hurt — as long as you're going with an unsweetened version. In other words, guzzling ginger ale won't exactly help your health. Ginger can help quell nausea. If you're feeling queasy, reaching for ginger water could be a smart move. The Mayo Clinic lists ginger as helpful way to combat both morning sickness and chemotherapy-induced nausea. "What the ginger will help do is speed up stomach emptying, so things can go from the stomach into the small bowels more efficiently," explains Lisa Ganjhu, DO, gastroenterologist and associate professor of medicine at NYU Langone Health. She frequently recommends ginger tea to patients — especially for pregnant women suffering from hyperemesis — and regards it as generally safe, but as always consult with your doctor about any G.I. problems that require medical attention. Countless home remedies claim to help relieve symptoms during that time of the month, but here's one that has some substance behind it. Ginger helped reduce menstrual cramp pain in a 2015 randomized clinical trial published in Archives of Gynecology and Obstetrics. Additional research has suggested ginger is more effective at relieving pain than a placebo when taken during the first three or four days of your cycle. The idea is that ginger's anti-inflammatory properties may work in a similar way to a nonsteroidal anti-inflammatory drugs (NSAIDS) like Advil, Dr. Ganjhu says. 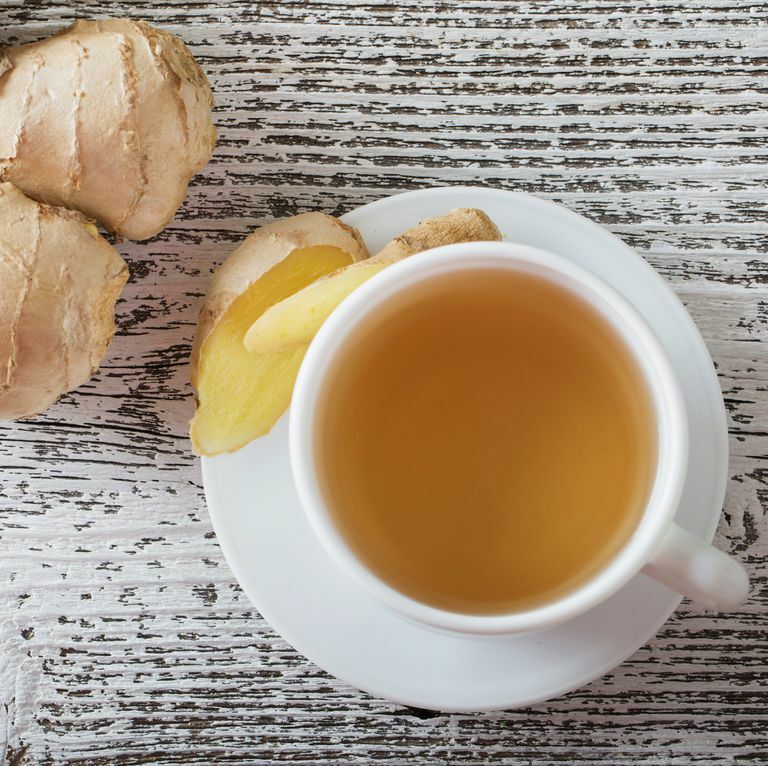 While most scientific studies thus far have looked at ginger in supplement form, drinking it in water or tea is worth a shot when you're doubled over from cramps. Ginger may also help balance blood sugar. While drinking sugary ginger beer certainly won't help you here, ginger does have some ties to improving blood sugar levels in patients with type 2 diabetes. Consuming 3 grams of powdered ginger per day helped patients improve their glycemic indices compared to a placebo, according to a 2015 study published in the Journal of Complementary and Integrative Medicine. Ginger water can promote weight loss. No, ginger water won't melt belly fat or torch calories, but it's still worth sipping if you enjoy the taste and want a more flavorful alternative to plain water. "Ginger tea is no weight-loss elixir in that it can’t directly impact metabolism," says London. "We see this effect mostly in green and black teas that have caffeine, but only in preliminary studies and the results appear to be both minimal and temporary." The real benefit here is drinking it in place of ginger ale or other sugary beverages, like super-sweet iced tea or a gingerbread-flavored latté. Ginger water contains almost zero calories and helps with hydration, two major pluses if you're trying to lose weight. It could reduce your risk of chronic disease. Ginger — along with other vegetables, fruits, nuts, seeds, beans, and whole grains – contain high amounts of phytonutrients. These antioxidant-like compounds may help counteract chronic inflammation, a physiological state where your body's cells stay on high alert due to a lingering or past threat. That response mechanism isn't always bad, but it can occasionally go awry and get hyperactive. Over time, this may play a big part in the development of diseases like arthritis and cancer. Phytonutrients like the ones in ginger may help by reducing the inflammatory response and protecting your body's cells from DNA damage. "What's more, gingerol and zingerone — the primary anti-inflammatory compounds of ginger — have been linked to limiting the factors that initiate the whole inflammatory process in the first place," London adds. If you don't love the flavor, don't feel like you have to down ginger water to improve your health. London stresses it's more important to follow a veggie-heavy, plant-based diet rather than rely on a single food (or in this case, drink) for nutritional benefits. CAROLINE PICARD Health EditorCaroline is the Health Editor at GoodHousekeeping.com covering nutrition, fitness, wellness, and other lifestyle news.